An outstanding 18th century central Anatolian kilim saf, high on the walls of the Mshatta Hall, Berlin. 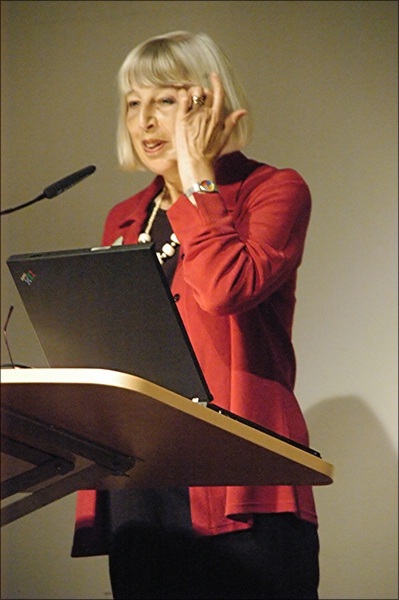 The 2008 Volkmanntreffen was held, like its immediate predecessors, in the shadow of the great Pergamon Altar at the Museum of Islamic Art (MIK) in Berlin. 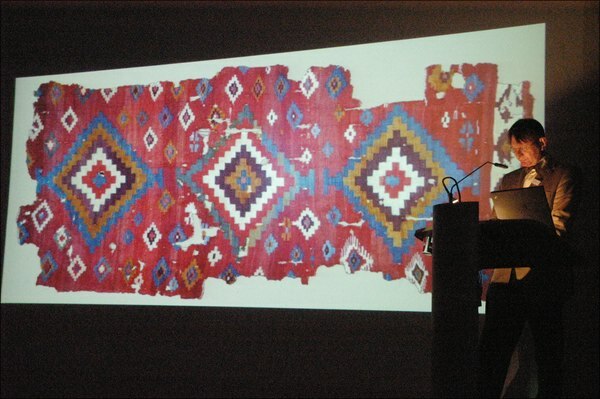 The theme of this year’s meeting, ‘The Undiscovered Kilim’, and of a loan exhibition of superior quality Anatolian kilims, was at least in part a direct response to the surprising lack of any attention given to the subject at last years’ Istanbul ICOC. 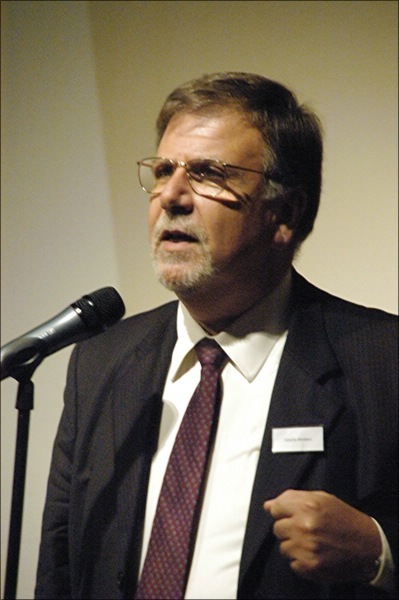 The international rug and kilim community owe much to the imaginative willingness to accommodate shown by the soon-to-step-down director of the MIK, Dr Claus-Peter Haase, and his team. They could so easily have been bureaucratic and dismissive of the suggestion from Christian Erber and his colleagues – early kilims are hardly a mainstream interest of the MIK – but instead they entered into the adventure with enthusiasm and skill at very short notice. This stands in sharp contrast to the inability of the St Louis Art Museum, for whatever ‘good’ reasons, to participate in any meaningful way in next April’s ACOR, for which the seldom-seen carpets from the James F. Ballard Collection at SLAM could have been such a sure-fire attraction (there’s still time!). 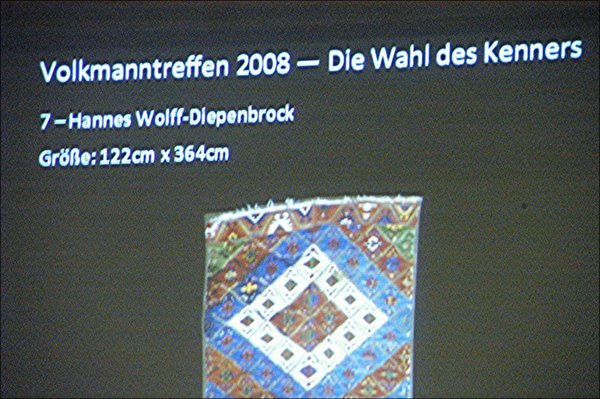 ‘Mythos Farbe’, the loan exhibition of early Anatolian kilims belonging to the Austrian collector Dr Norbert Prammer (previously exhibited in his native Austria in 1999 and 2006), opened on the evening of Friday 10 October in the echoing Mshatta Hall, where a crowd of two hundred plus from Germany, Austria, Switzerland, France, Italy, the UK, Russia, Turkey, Israel and the USA, were treated to the amazing sight of old kilims – the work of anonymous peasant women from Anatolia – integrated with one of the world’s premier displays of Islamic art. A blaze of colour and traditional design no less magnificent than the intricately carved ancient grey stone of Mshatta, the kilims were scattered throughout the Islamic galleries and on the walls of the broad main stairs leading up to the department, intimately associating the genre with many of the ‘iconic’ classical carpets in the permanent display and placing them squarely in the public eye until January 2009. Punctuated by the sound of a string quartet (barely semi-audible due to the Mshatta Hall’s hard acoustics), a brief speech of welcome and thanks was made by Dr Haase, He was followed by kilim collector Johannes Wolff-Diepenbrock, who insofar as my relative lack of linguistic skills allowed me to understand, pointed out that the essence of Dr Prammer’s collection was the vibrant colour of old kilims with simple, ‘archaic’ designs, regardless of condition. 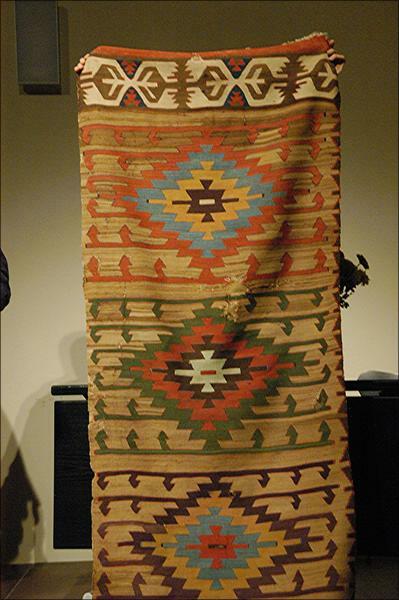 As a fellow kilim collector, he welcomed the sight of kilims and kilim fragments presented in a major art museum as objects of art rather than as ethnography. Last word of the evening went to collector-extraordinaire Ignazio Vok, for whom great Anatolian kilims are just one of many exotic interests. The ebullient Herr Vok, resplendent in a sky-blue linen suit, warmly characterised Dr Prammer as a ‘Lucky Collector’. About half of the cast from the vernissage assembled the following morning in the MIK lecture theatre, literally beneath the Great Altar, with acoustics better suited to serious discourse. Here too there were splendid kilims on the walls and the floor. 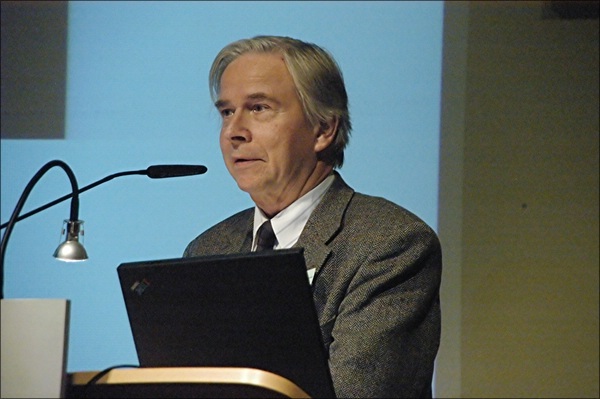 Dr Haase got things going, and greetings were passed to the annual meeting from its founder, Martin Volkmann in Munich, who is no longer able to travel. 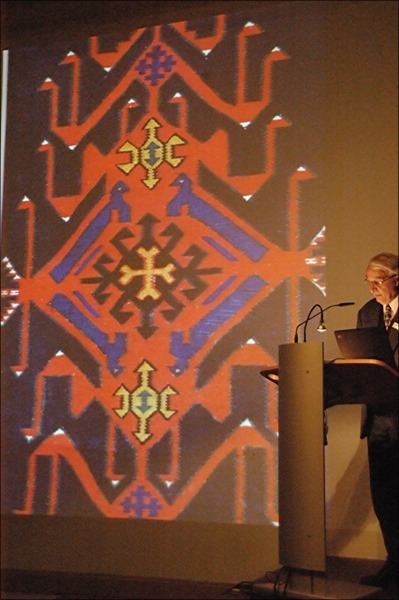 Then the lectern was taken by former MIK director Dr Volkmar Enderlein, whose interest in kilims is well-established. 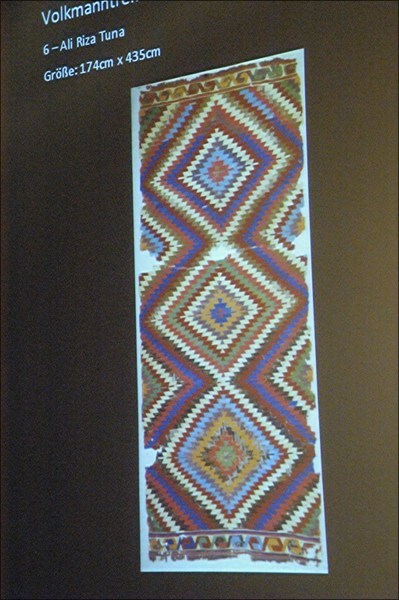 His theme was the very distinctive so-called ‘Avar’ kilims from Daghestan in the northeastern Caucasus region. 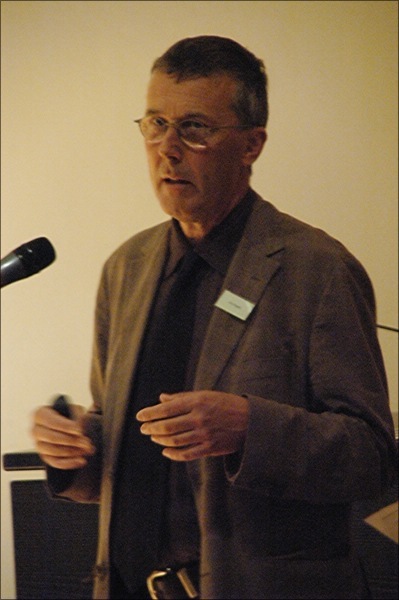 He reviewed and in some places questioned the conventional wisdom on the subject, much of it published in HALI, with particular reference to an early-dated piece and others in an extensive German private collection. There’s more to come on this particular subject. Next up was a remarkable woman, Martha Henze from Washington, now over eighty. 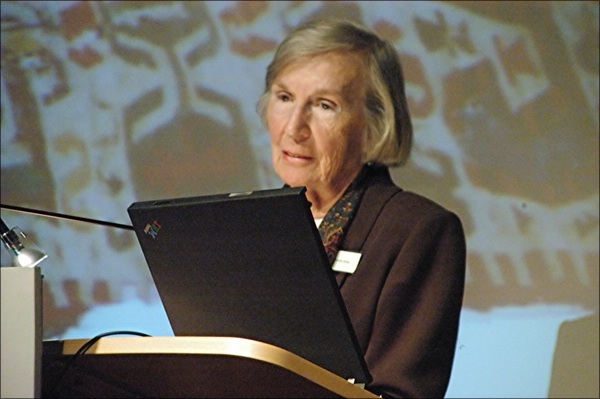 Speaking in German, she gave an account of how, stationed in Ethiopia with her diplomat husband Paul, while travelling to remote villages they ‘discovered’ a trove of antique Anatolian kilims, now reduced to rags and tatters, kept in many local Ethiopian Christian churches. 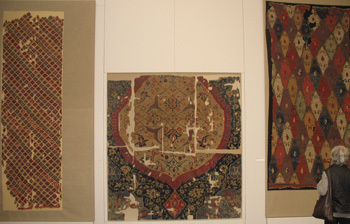 These kilims, and other finds, including pile rugs, are evidence of an extensive but little documented trade between the Ottoman Empire and the Ethiopian Highlands. Here too there is more to be said: Ms Henze is the winner of the 2008 A&M research award, sponsored by HALI and Cornucopia magazines, and will publish her findings. 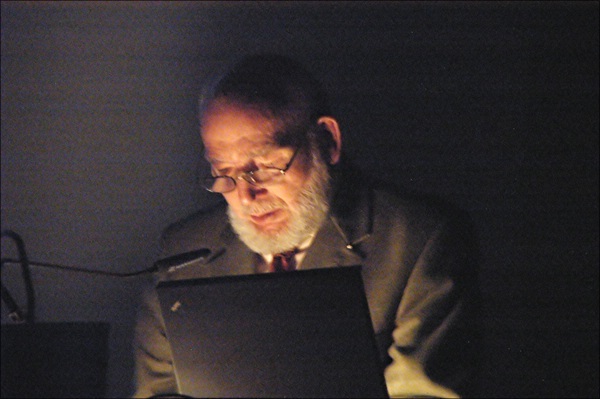 The Berlin meeting was dedicated to the memory of two much-missed friends in the world-wide community of those devoted to Turkish nomadic weaving, to whom warm tributes were paid – a rerun of Andrew Finkel’s video conversation with Josephine Powell, and words from Bethany Mendenhall about her late husband, Charles Lave. These offered a reflective pause before the first round of the Volkmanntreffen’s museum-friendly version of the traditional show-and-tell - more of a ‘Connoisseur’s Choice’. Local collector Georg Rabe, Chris and Manfred Stossier from Vienna, and Dr Ayan Gülgönen from Istanbul each in turn presented a top-class kilim from their collections. The pieces were among those surrounding us in the room, and their presentations were accompanied by good Powerpoint images and additional information. The quality was high, the discourse amiable and more concerned with colour, art and feeling, not materials and meaning. The afternoon began with another round of ‘Die Wahl des Kenners’. 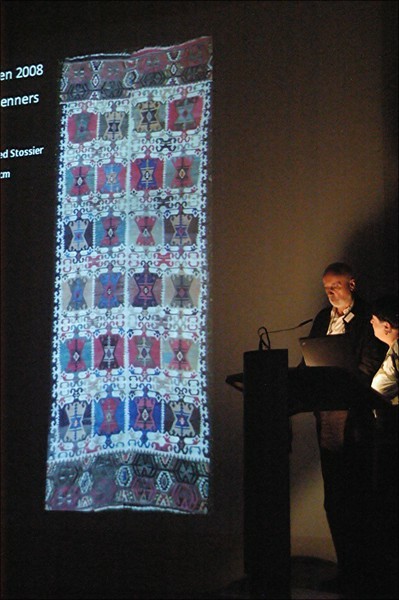 Dietmar Pelz gave a good clear simple Powerpoint presentation (the efficient norm for all ‘papers’ at this event) about his lovely early-dated rose-ground stepped-medallion kilim, hanging on the wall of the theatre, ostensibly Anatolian but with much of northwest Persia about it. Two heavyweight presentations in English followed. In ‘Tapestries from the Desert Sands’ Michael Franses led us on a rapid but detailed and textile-filled scenic tour from the borders of China to the shores of the Mediterranean, everywhere that ancient tapestry-weaving traditions flourished. 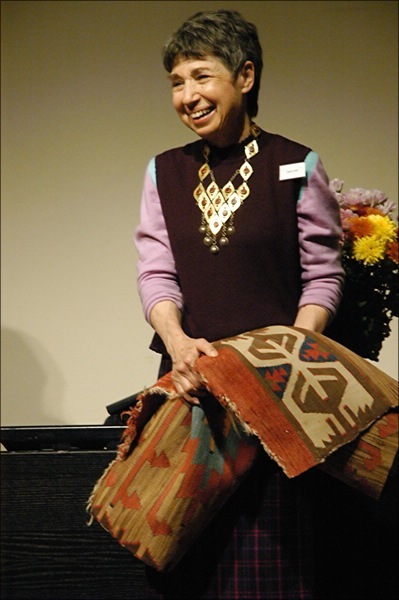 Then Dr Elena Tsareva from the Kunstkamera in St Petersburg switched the focus to the kilims and tapestries of the early steppe nomads by reference to the incomparable treasures in the Hermitage collection from the famous Pazyrk and Arzhan kurgans of the Altai and Tuva highlands in southern Siberia. After a short break, the afternoon session was brought to a close with more kilim connoisseurship: presentations by Ali Reza Tuna and Transatlantic collectors Marshall and Marilyn Wolf, who had brought a lovely camel-ground half-kilim with them in the hope that “someone might know where the other half is”. Later in the evening, the high point of the group buffet dinner in the Treffen’s designated hotel was undoubtedly not the food, but rather the extremely smooth after-dinner performance by Dr Prammer and three fellow medics from Linz of a delightful series of unaccompanied Tyrolean lieder. The following morning, Jürg Rageth, an old kilim hand now much concerned with the science of C-14 dating and dye analysis, presented a dense and often fascinating review of the possible silk textile antecedents and more recent relatives of the ‘star and cross’ tile pattern seen in a well known early-dated Anatolian brocaded flatweave fragment, also currently on display in the Berlin museum (Werner Brüggemann, Yayla, 1993, back cover). 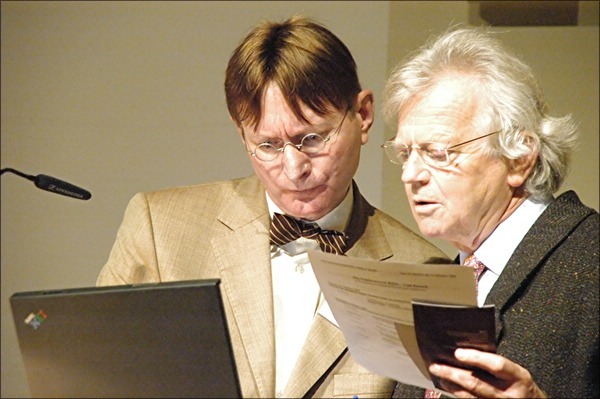 He was followed by the final connoisseur-collectors with their choices, Johannes Wolff-Diepenbrock and Ignazio Vok, who alone among the chosen presented two pieces, neither of which, disappointingly, was actually in the room. 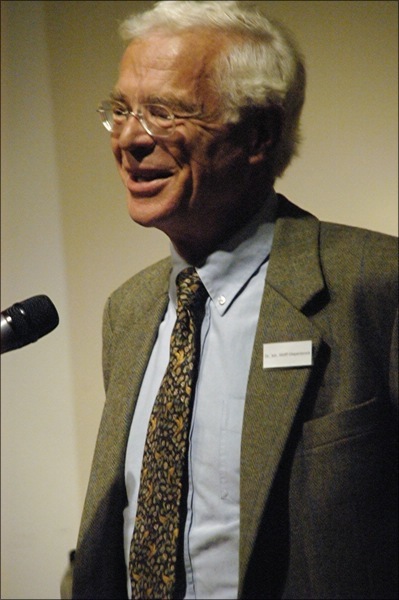 The proceedings were then brought to an end by a characteristally sonorous, at times even poetic, ‘sermon’ delivered without images by Dr Brüggemann, who among other weighty issues addressed the theme of recent progress in ‘kilim studies’ with a fairly dismissive, but not altogether fair, “none since 1993”. 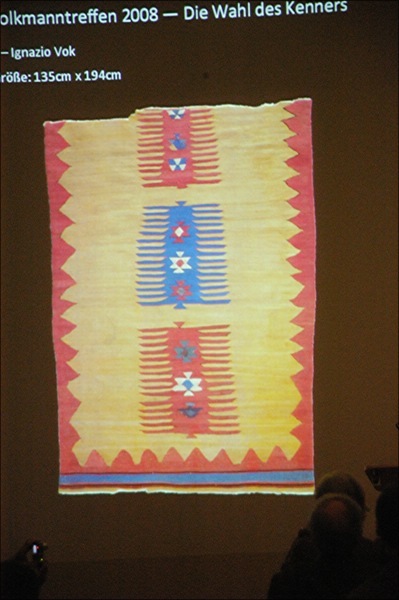 The scholastic picture as far as kilims, especially those from Anatolia, is not, perhaps quite as bleak as that painted by Dr Brüggemann. Since early 1990s, the ‘mythos’ aspect of kilimology, which was for a while so vigorously occupied with thoughts of the Mellaartian ‘mother goddess’ and her feathered friends, has largely been left behind by kilim fanciers whose response has much more to do with the ‘farbe’ aspect (colour, art and beauty), as well as the science, ethnographic or chemical, that goes with it. 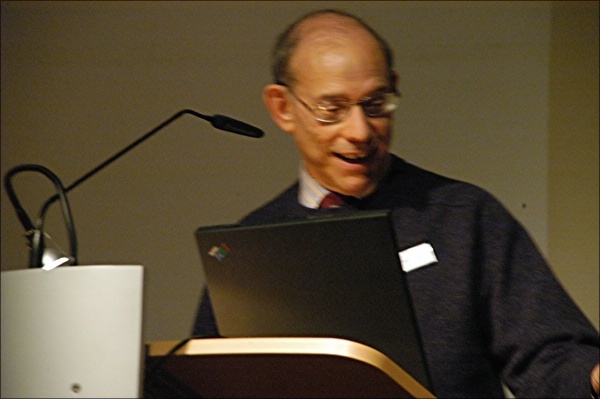 To some extent, Dr Bruggemann is still fighting a battle that is already won. 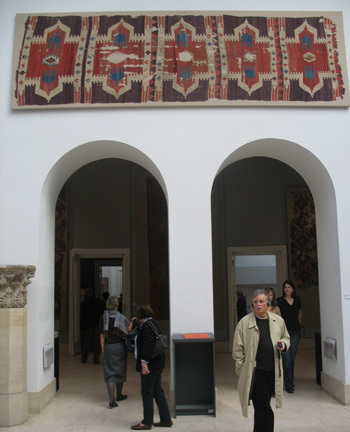 In the meantime, their prominent exposure in a very busy major international museum has greater potential to bring kilims as art to the notice of a wider audience than the 1990 display of the McCoy Jones kilims in San Francisco, ‘Yayla’ at Berlin-Dahlem in 1993, Harald Böhmer’s more recent efforts in Rotterdam, or even Josephine Powell’s great achievements in Istanbul. 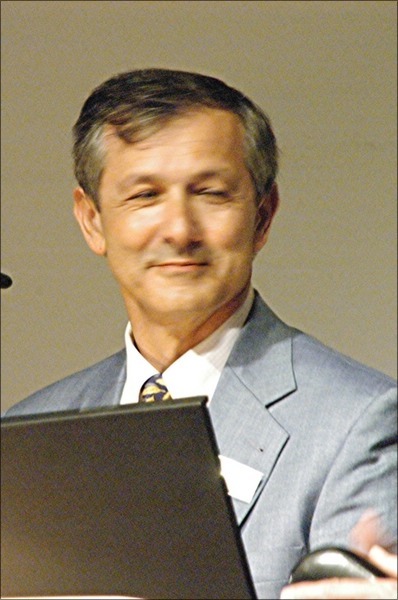 The meeting was brought to a close by Christian Erber, who announced that next year the theme of the meeting, again hopefully to take place in Berlin, would be Central Asian suzanis. 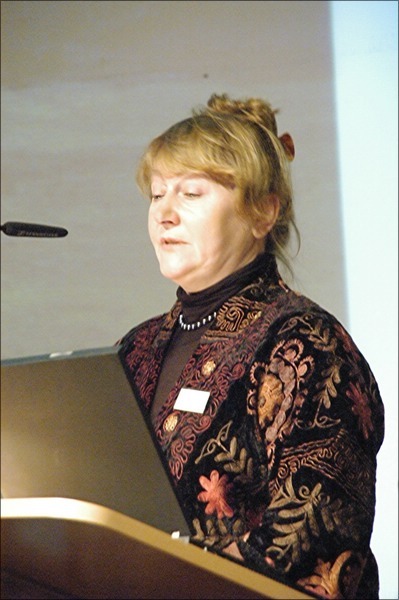 Postscript: One further item of interest arose at the end of the meeting, when Alberto Boralevi rose to inform us that he and Elena Tsareva had taken the opportunity, with Dr Haase’s permission, to look again the structure of the museum’s famous Bode cloudband prayer rug in the permanent display. This was because, since seeing it in the recent ‘Venice and the East’ exhibition in Paris, they had suspected that it might not be symmetrically knotted. Their close examination (from the front only) in Berlin confirmed their suspicion that this ‘iconic’ Turkish rug is indeed asymmetrically knotted, opening the door to potential speculation about its origin. 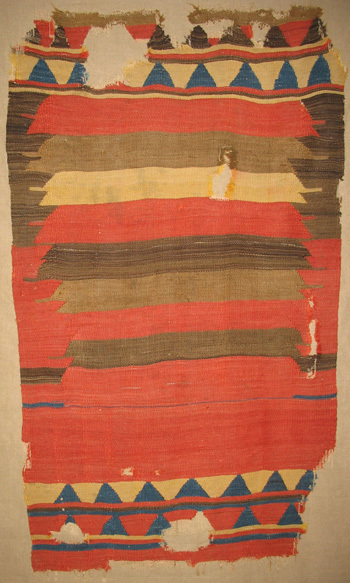 Dr Ayan Gülgönen's little kilim. Kilims with the MIK's now complete Ushak white-medallion carpet. Ich danke Dietmar Pelz und Wolfgang Ritter für die Überlassung der Fotos.